We've got an entire UK Game Convention Calendar(includes Ireland) at Game Convention Central. There are over 30 cons listed (and I already did run through the threads here and added the handful we were missing). The rest of the site lists over 400 game conventions on 6 continents! No 'e' s in my name! Continuum 2012. John Foster Hall, Leicester University. UK. Friday 20th - Monday 23rd July 2012. 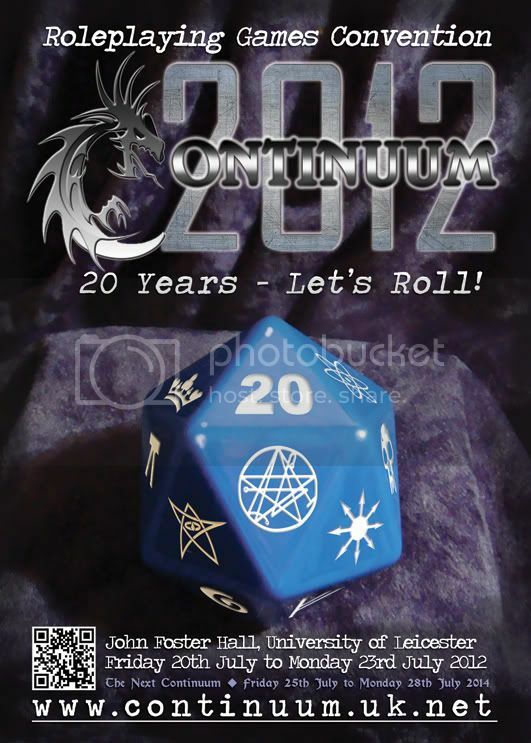 Continuum will be Friday 20th July to Monday 23rd July 2012. John Foster Hall, Leicester University Halls of Residence, Oadby, Leicester, UK. The date refers to the 2012 Mayan apocalypse prophecy that foretells the end of the world. The main theme of the convention will be Apocalypse, End of the World/Galaxy/Universe/Multiverse, Judgment Day, Ragnarök, Götterdämmerung, Qiyamah, End of Days, Armageddon, etc. AmberConNI, the latest addition to the AmberCon series of Diceless Gaming Conventions, will be held in Belfast Northern Ireland on the weekend of the 28th to 30th of March 2014. 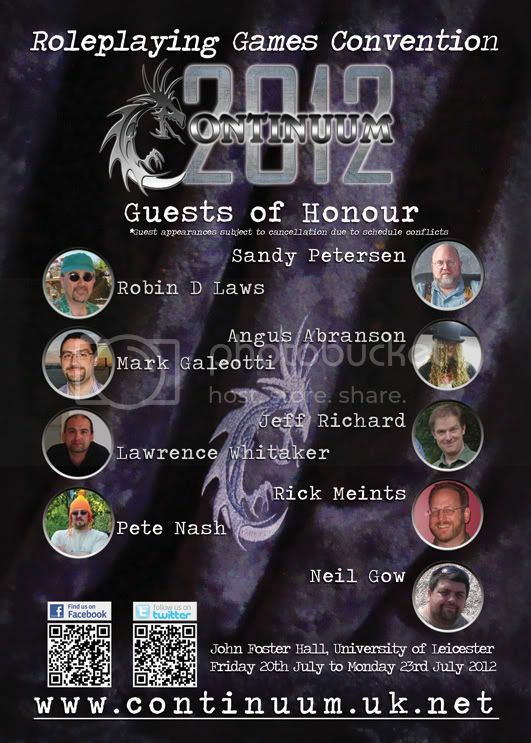 You can find out everything about the con at www.AmberConNI.org.uk and we look forward to seeing you there! There's also Concrete Cow 14 (8 March, Milton Keynes). There's a thread here with more details on the Concrete Cow web page. See you there! 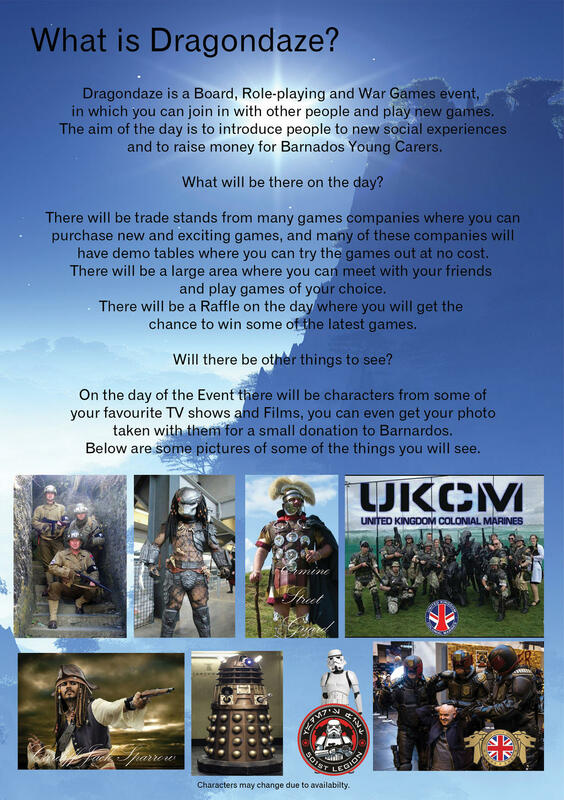 Seven Hills is a new roleplaying convention, to be held in Sheffield, the Rome of the north, on the 26th and 27th of April 2014. It will be held at the Garrison Hotel, which should be familiar to those who have attended the Furnace convention. Seven Hills 2014 has a broad science fiction theme. We aim to have over half of the games on offer belonging to the science fiction genre, whether space opera or hard science fiction, cyperpunk or Star Wars, alien invasions or transhumanism. Other games are also welcome. Are there any upcoming conventions in June o July? I was at the UK game expo and it was really fun! There are a couple in the UK in June/July 2014. Friday 25 July - Sunday 27 July 2014. Hi the Dragonmeet Convention www.dragonmeet.co.uk in London is on Saturday 6th December at the big new venue ILEC Convention Centre, Earls Court and has booked up 80% of the trade space already with big minis companies like Battlefront, Prodos Games, Hawk Wargames already confirmed and more to be announced through September. You can see the full traders list below and there will be a Warmachine and Heroclix tournament announced soon as well as other big demos. You can expect lots of skirmish games, boardgames, RPG's and card games and the show is now open late until midnight for gaming! Are there ever any in Bristol?